Six of the Midwest’s top farm-to-table chefs, a pastry chef and a master sommelier will be gathering in Columbus for a one-night-only collaborative dinner with host, chef Bill Glover at the Gallerie Bistro and Bar inside the Hilton Columbus Downtown on Thursday, Dec. 5. The collaborative dinner is a stop on the Celebrity Chef Tour presented by the James Beard Foundation and includes Jonathon Sawyer, owner of the Greenhouse Tavern and Noodle Cat restaurants in Cleveland. The Gallerie Bar & Bistro is an inspired French bistro located in the Short North inside the Hilton Columbus Downtown. Glover embraces Ohio&apos;s rich agricultural heritage and remarkable craftsmanship by featuring items on the menu from local farmers and artisans who maintain sustainable practices. Another central Ohio chef collaborating on the dinner is Josh Dalton, owner of Veritas Tavern in Delaware. 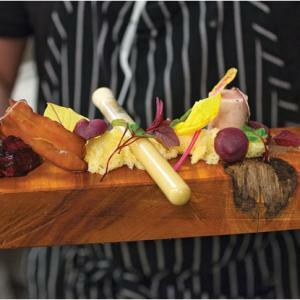 Dalton practices molecular gastronomy and prepares surrealist dishes. His quirky spins on classic tavern fare have quickly made Veritas Tavern one of Central Ohio’s best new restaurants. Other chefs from across the Midwest collaborating on the dinner include: Drew Sayes, chef and owner of The Rugby Grille in Birmingham Mich., Trevett Hooper, chef and co-owner of Legume Bistro in Pittsburgh, Daniel Wright, executive chef and owner of Senate and Abigail Street in Cincinnati, Matt Danko, pastry chef at The Greenhouse Tavern and Noodlecat in Cleveland, and master sommelier Matt Citriglia, president of Vintage Wine Distributor and director of education at Winementor, Ltd. in Columbus. The multi-course meal promises to be a work of artistry and craftsmanship that will provide an unforgettable experience for guests. All courses are paired with great premium wines and Belgian beers. The event starts at 7 p.m. on Dec. 5. at the Hilton Columbus Downtown. Tickets are $160 per person inclusive, and can be ordered online at http://www.celebritycheftour.com/events/Hilton-Columbus.html.